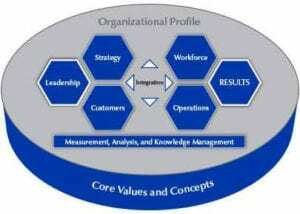 The Baldrige Performance Excellence Program was developed in 1987 by the U.S. government in response to a crisis in the ability of U.S. businesses to compete most effectively. The award is named for its creator, former US Commerce Secretary Malcolm Baldrige. Foreign manufacturers’ superior management systems had enabled them to seriously challenge inferior U.S. quality and overall performance standards, or to risk further significant losses. 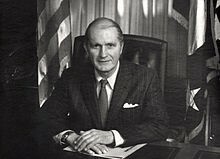 Former US Commerce Secretary Malcolm Baldrige. Since then, the Baldrige program has proven to be so extraordinarily powerful and transformative across multiple business sectors that, now, it is viewed as a competitive necessity by the healthcare industry. 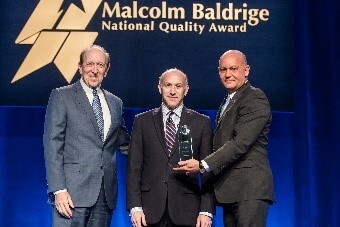 In fact, more than 50% (12 of the 22) organizations that applied for the Baldrige Award at the national level in 2014 were hospitals or health systems. This data can be found at www.NIST.gov. Dr. Kenneth Cohen receives recognition from George Benson, PhD and Al Faber in honor of The Synergy Organization’s longstanding support for the Baldrige Program. Clearly, just as the healthcare industry has adopted evidence-based approaches to providing clinical services, healthcare has responded to the evidence about Baldrige’s incomparable value.